The Malaysian government's controversial decision to restrain non-Muslims from using the word 'Allah' for God, defies logic. In the Holy Quran, the first surah, starts with 'Alhamdulillahi-rabb-il-alamin', which means, 'The God of the World', not the 'God of Muslims' alone. It is 'aalamin' [for the entire world], not 'muslimin'. Clearly, there is no Islamic basis either to bar any community from using the word 'Allah' exclusively. Secondly, words like 'Rab', 'Malik' or 'Khuda' are being used for centuries God in different regions by Muslims. This is about local culture. Similarly, Christians or adherents of other religions who live in Malay-speak or Jews and other minorities in Arabic-speaking areas, have been using the word 'Allah' for ages. Don't Muslims use the word 'God' quite often? 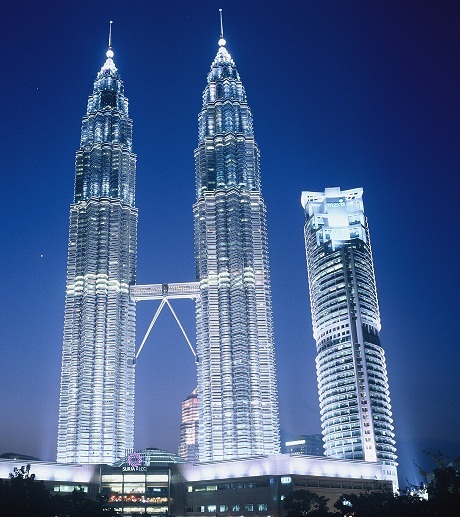 In fact, the Malaysian government's succumbing to certain clerics' diktats, is surprising. Also, the court order should have been reversed. It sets a bad example. It is not just against the principals of democracy but also in violation of Islamic spirit. When a government in a country like Malaysia takes such a decision, then it is all the more disturbing. Its international image as a modern, progressive country would also be hit. I fail to understand what drives the regime to take such a step or what are the fears of certain Ulema? Do they feel that use of the word 'Allah' in sermons and prayers would attract Muslims towards Christianity. If they have such fears, then it means that they have less confidence their own religion and community, and are more worried about propagators of other faiths. Such bans are used to harass religions minorities and create religious tensions. It is a totally unjust and nonsensical ban. Further, it shows growing intolerance in the society. And it must be condemned. Hope that good sense will prevail and the decision would reversed soon. Malegaon's emergence as capital of Urdu language in India: When Urdu books worth Rs 1 million are sold in a day! 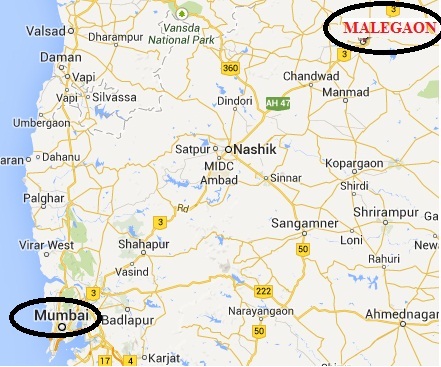 Malegaon is today the capital* of Urdu in India and there can't be any doubt about it. A bustling town that has a population of nearly 6,00,000, it is today becoming the heart of Urdu culture in the country. Just when we hear pessimism over decline in sale of books in most languages, a ten-day Urdu book fair organised at Malegaon, saw sale of Urdu books worth Rs 87 lakh [8.7 million]. This is a record in the country. In fact, many book fairs in metros where books of dozens of languages are available, don't match these figures. The National Council for Promotion of Urdu Language (NCPUL) had organised the ten day book fare. On the last day alone, books worth Rs 10 lakh or 1 million were sold within a few hours. Imagine, these are figures from a city which is considered a backward place and where half of the population lives in slums and shanties. Such was the excitement among Urdu lovers, that books worth Rs 8-9 lakh were sold every day during the 'Kitab Mela'. People came from Dhule, Jalgaon, Pune, Ahmadnagar, Akola, Bhiwandi and other places in the region, to buy books here. With time, languages spread and thrive, hence, the linguistic landscape also changes. Once, Delhi, Lucknow, Rampur, were centres of Urdu in North India. Then, Deccan region that had seen the birth of early Urdu, once again preserved the language and its culture. Now, the culture is thriving in middle-level cities and towns across the country. Among them, Malegaon, is the most well-known. It is often said that the city has the most per capital presence of poets in the world. 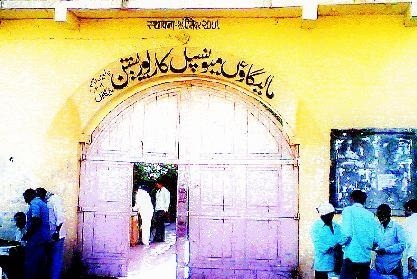 It also has an abundance of Urdu publications.Malegaon is a city and municipal corporation in Nasik district in Maharashtra. For decades, it has suffered official apathy, in terms of infrastructural development. A city of powerlooms, it was inhabited by migrant Muslims from Uttar Pradesh (UP), who fled from their hometowns after the first war of independence in 1857. The City has over 70% Muslim population. Divided by the Mausam river, it is also known for the unique names of its mohallas and chaurahas like Tension Chowk, Rishwar Nagar, Chaon Chaon Road & Achanak Nagar. The recently concluded book fair makes it clear that there is no dearth of Urdu lovers in India. Neither the language faces any bleak future. Those talk pessimistically about Urdu are those who aren't aware of the changing landscape. Today, Maharashtra, Karnataka and regions of Bihar, are the Dabistan-e-Urdu just like, UP-Delhi region was, once. This is the English translation of Ratna Kumar Sambharia's short-story 'Dronacharya Zinda HaiN'. For those who aren't aware of the background, Dronacharya taught royal family's children [in the epic, Mahabharata]. When he saw that a tribal youth Eklavya had better archery skills than his favourite disciple, Arjuna, then Dronacharya asked Eklavya to severe his thumb and give it away in guru-dakshina, so that Arjun remained the best warrior in the world. Dronacharya had also refused to teach Karna, as the latter didn't belong to the high caste. Incidents of students coming suicides in top education institutions due to caste bias are quite common even today. The examination was over and the teacher had just compiled the result. Now, while preparing the merit list, he was looking at the result-sheet when he suddenly got a jolt. “Ramdin, the son of a mochi (cobbler), is the topper, has got more numbers than anyone else, even ahead of my own son”. “Everyone in the village would spit on my face that the boy [mochi’s son] is more intelligent even though his father mends the shoes”. The Master sahib was really upset. Furious, he got to his feet and rushed to the other side of the room. He unlocked the almirah and took out the stacks of answer-sheets. One after the other, each stack was opened. One answer-sheet was taken out from each stack and kept aside. The selected answer-sheets were now placed in a corner of the table. Master sahib, took out his specs, cleaned the glasses and began re-evaluating Ramdin’s answer-sheets. Ample changes were made and the answer-sheets were again placed in the stacks and shut in the almirah. A new result sheet had been prepared. 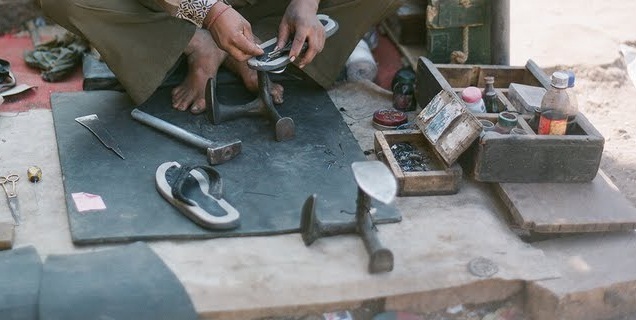 After failing in the examin, Ramdin had taken up his ancestral work at his father’s shop. The moment reports about Bollywood star Salman Khan's meeting with Narendra Modi, started appearing on Tuesday afternoon, social networking sites were flooded with comments. It was inferred that he had endorsed the latter for the post of PM. Khan didn't say directly about who should be the Prime Minister. But said that God would decide the best man and then also pointed at Modi, saying that "there is a good man standing amongst us". The middle-aged star also had lunch with Modi. The Gujarat chief minister also tweeted about his meeting with Salman. Many Muslims seemed upset with Khan, who had recently gone to Saifai despite criticism that while riot victims were denied relief, the Chief Minister was having fun with Bollywood actors. While Alia Bhatt, had apologised and her father Mahesh Bhatt said that it was the failure of his upbringing that she went to participate in the event. Khan had defended the decision then also. There were sarcastic comments from different sides and that how film stars can go anywhere to dance, if they are offered money. Now many of his fans are hurt. There are angry posts and even cartoons mocking Khan. Even in the post-partition era, the most idealistic stars who were staunch communists, didn't lead the kind of life which they propagated. 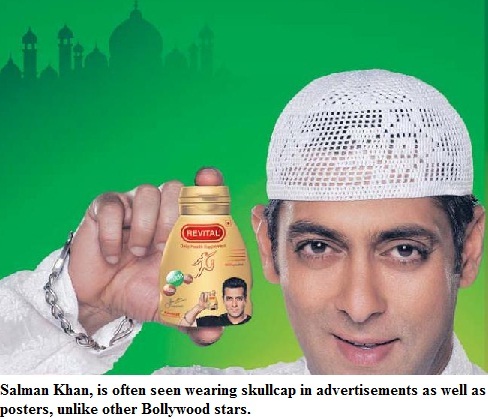 Among stars, Salman Khan has a very strong appeal among Muslim youths. 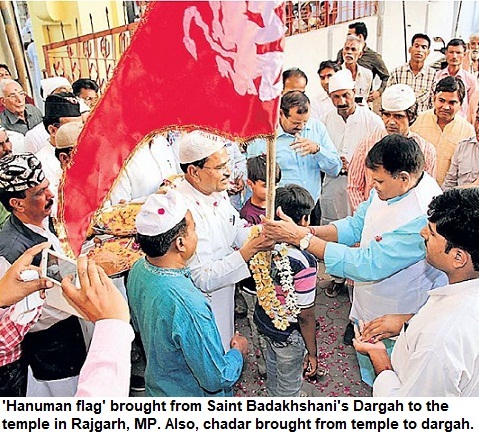 He is the person whose posters with skullcap on his head, are seen in Muslim localities. In coming days, there could be protests on the streets in different cities. The effigies may also be burnt. Perhaps, the fans, have a right, to be upset. But isn't it irrational to expect that you star will always be politically correct and always behave in accordance with your affiliations and expectations. There were posts on Facebook that how could Salman Khan meet Modi? After 1992-93 Mumbai riots, who had stopped meeting Congress leaders or the then Chief Minister Sudhakar Rao Naik, though more people were killed in those riots than Gujarat 2002. The billionaire stars act in politically correct manner just because they tend to avoid controversies. It is not about taking stand or not taking stand. Salman Khan's act may anger his Muslim fans, but it can also boost his image among his hardliner right-wing fans. The criticism is that if celebrities, especially, the Muslims, keep meeting Modi, then it will give credibility to the latter. May be, such things slowly and steadily have an impact. The fear among certain sections is that the anti-Modi stance will get diluted. Many 'secular Hindus' were also upset with his 'endorsement of Modi'. But why? If he is a Muslim he is supposed to be anti-Modi? There is no logic in it. Then, all Hindus should be pro-Modi. But the biggest opponents of Modi are Hindus, aren't they? Either we talk in terms of activism, legal fraternity, political class or police officers, majority of those opposing him are not Muslims. Similarly, to expect that Muslims are monolithic to such an extent that everybody is expected to act in the same manner is absurd. Why should we expect that Salman Khan or any other celebrity will take a stand. There is no surprise. With general elections a few months from now, we will see such occurrences and 'controversies' on a regular basis. 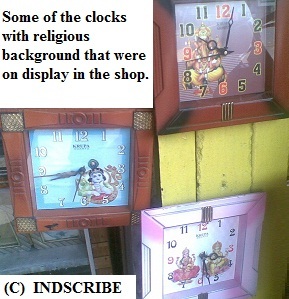 'Religious clocks' sell briskly at this shop: Will you buy Hindu Clock or Muslim Clock? Just a few days back, I had an interesting experience. A friend had bought a watch for me as a gift from abroad but I couldn't wear it because its strap [chain] was loose. That day I went out with the watch in my pocket. On way, I saw a small shop where there was no customer. It took the man barely a few minutes to take out the links and fix them again, using the hammer and other equipment. I asked him, if I could get a good clock. The wall clocks in my house were not working well. In the drawing room, the clock stopped after a few weeks. I changed batteries but nothing happened. I replaced the clocks but the problem persisted. The shop owner asked me, 'Kaun si ghadi lenge?'. 'Koi si bhi dikha dijiye", I said. "Dharmik [religious] ghadi chalegi?". "Kaun si". "Hindu ghadi ya Muslim ghadi", came the reply. "Ji?" "Yahi zyada chal rahi hain aaj kal", he said. Now I was a bit surprised. He pointed his finger towards these clocks. There were lines of such clocks. The background had either Hindu gods or Islamic photographs. Hmm, so these are the Hindu and the Muslim Ghadis! "Log lete hain inko? ", I again asked. "Sab se zyada yahi chalti hain, bhai sahab", he said. "Hindu wali mein Ganesh ji wali zyada bikti hai", he added. There was another interesting aspect. The price range was slightly different. 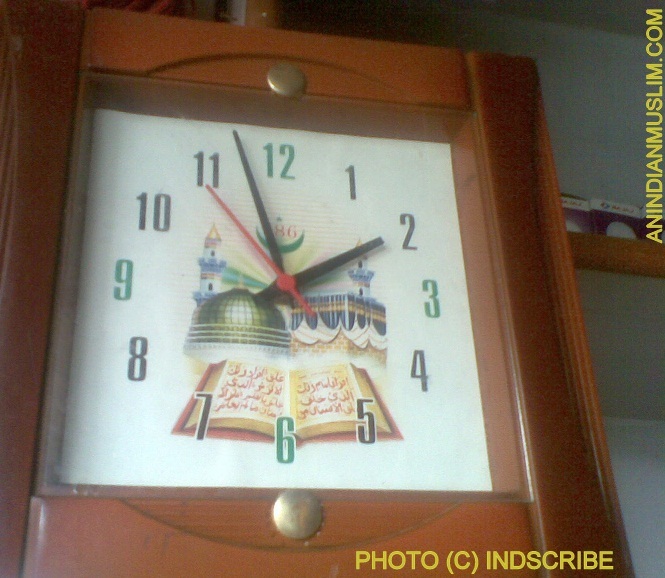 For example, if clocks of A group cost Rs 160, the clocks of B group cost Rs 170. Now I won't tell you which clock--Hindu or Muslim, is costlier of the two, because it will lead to different interpretations. You can, of course, speculate. There were no Christian or Sikh clocks though. I came out wondering, why would people buy these clocks? Is it just a fad. Or because this shop was near a locality of particular economic stratum, that these clocks sold more in this area? I don't think that big showrooms would have many such clocks. 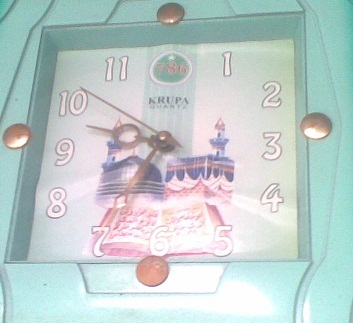 Perhaps, when a person takes home the 'religious clock', the family members are happy. As they feel that there is another godly or spiritual thingon their wall. People put up religious posters, calendars, photographs on the walls for a variety of reasons. So it is the 'Barkat wali ghadi' or as goes the old adage 'Aam ke aam, guthliyo.n ke daam'. 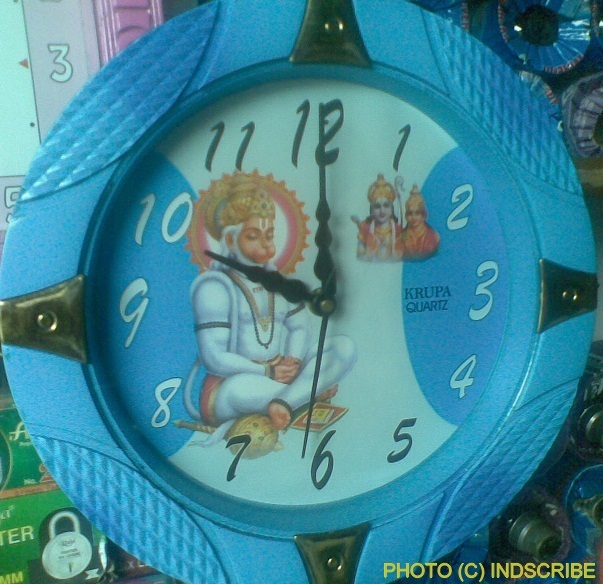 It is also possible that a Hindu may be Muslim clock or a Muslim may buy Hindu clock. Yes, it happens a lot, when people buy gifts, for friends. Friends have gifted my Perso-Arabic calligraphy in the past. While I end this post, just a reminder. It is a light post. I found it amusing and so wrote about it. There is a demand for certain type of goods and so they sell. It is not like the 'Hindu water, Muslim water' sold in pre-independent era. So don't take it to your heart.